During a recent retreat, I came to the conclusion that I had too few earthy colors, and that I needed some additional beads to use the materials I’ve been using. My recent beadwork has involved a lot of natural materials like stones, shells, and wood. 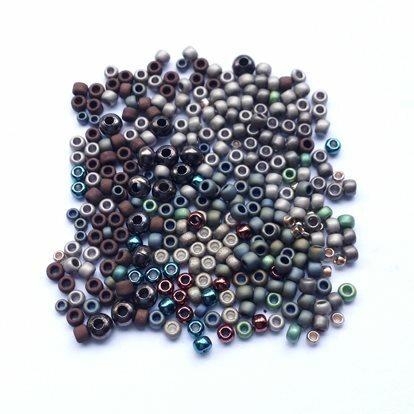 In line with this, I placed a bead order that was very heavy on gray, metallic, matte, and brown beads. There’s nothing like having someone else say out loud what you know in your gut. I know that when I look at a field of dry grass, it isn’t just light gold; it is interspersed with purple brushes and dark red random stalks. Even a field of gray includes blue, black, purple, or even red highlights and shadows. It makes me think about a Van Gogh image, rife with bright hashes and primary color accents that give it life. Despite my original intent to work completely in gray to create the feeling of a stone path, the results are boring. This is a perfect example of the power and impact of color. My next work is to determine which colors to add. After all, I am who I am, so I will include some green, blue, and a dash of coppery orange. To get a balance, I created a small blended group (shown in the photo), adding beads until I am satisfied with the proportions and the color mix. This isn’t a very scientific approach to creating a great palette, but for me, it works perfectly, and it makes me curious about how other artists approach color. Do you have a method to choose and refine colors for your designs? Are you a confident master of your palette? If you’ve ever considered learning more, don’t miss the opportunity to join artist and instructor, Mary Tafoya for a journey through color theory. Bust out your colored pencils and learn everything from terminology to symbology. Understanding color is powerful, and no matter what your choice of medium, that understanding is a creative ally. Join us for Hands on Color Theory: A Workshop for Artisans and Crafty Souls, and learn to use color confidently as a tool for expression, to create better sales, or to make that final decision on what color to paint the living room.